Have you ever wished you could focus better on the things that really matter from day to day? You can – and the secret is found in living intentionally. Learn how to strengthen your relationship with God and your family members, as well as how to better manage your home and your time. 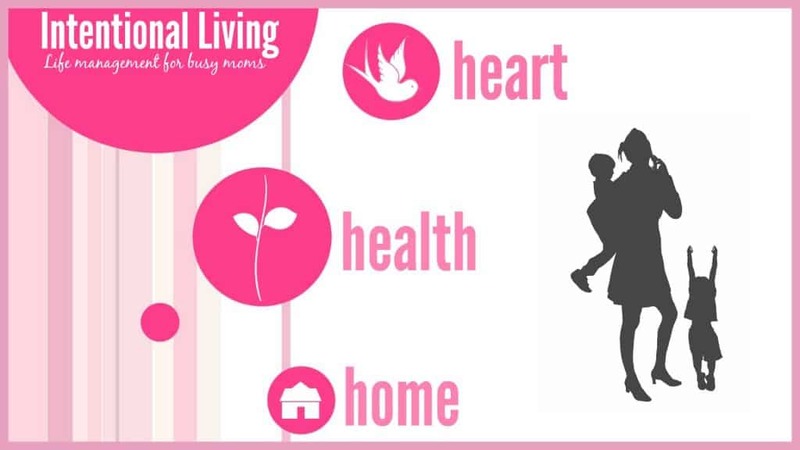 In my Intentional Living Course, I will come alongside you and provide powerful encouragement, teaching, and action steps to equip and inspire you to live an intentional life as a busy mom. I know what it is like for busy moms – feeling like there are just so many things calling out to us- and as a result losing our focus. We waste time trying to do a little of this, and a little of that, but really accomplishing little. Even though we are busy, it seems like we never have time to do those things which are most important. As I was thinking about this, I was reminded that we all have the same amount of time in our days. We all have 24 hours a day to use as we please or choose. While we can’t always control our circumstances and things do come up, for the most part we could do better at figuring out how to make time for those things that are important to us. The truth is that we make time for what is important to us. I know there are things in my life, and probably yours too, that we do actually feel are very important. Yet we feel so BUSY that we blame our neglect of them on not having enough time. I believe that you can do better by being intentional. You need a PLAN to live intentionally. Without a plan of action, it’s unlikely that you will move forward with your priorities. 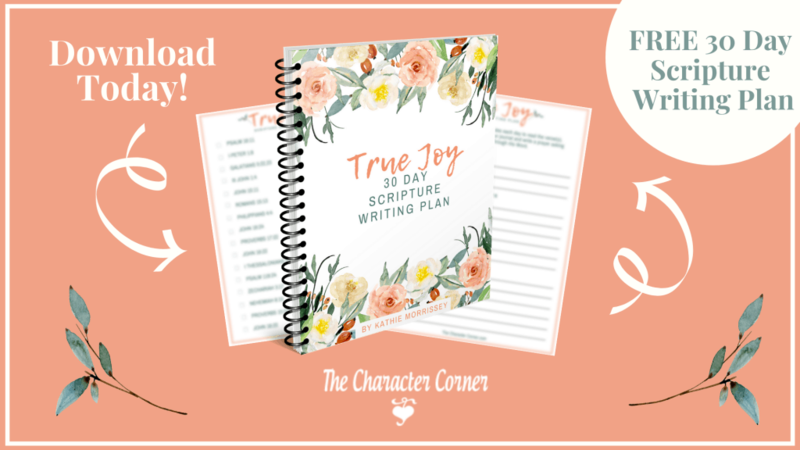 After living in a state of overwhelm, feeling stressed and discouraged, I wondered HOW I could better manage my life and make a plan to live more intentionally. Since I was already overwhelmed, I realized that I needed to take one area at at time, and work on slowly developing intentional habits in that area. Rather than making a big list and trying to do them all, I listed what was important, then set up a plan to begin implementing those daily habits into my routine. Habits usually take 21 days to develop, so rather than trying to make several improvements in each of the three areas, I realized it worked MUCH BETTER to start small with one or two changes till they developed into habits, before moving on to more changes. The result? Habits developed as I began to live intentionally, and I no longer felt so stressed and overwhelmed. Even better, I didn’t feel like a failure any more. 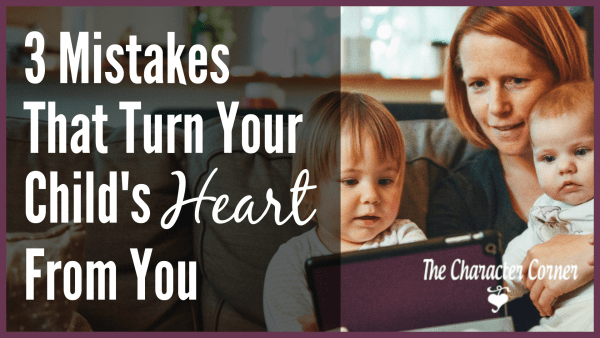 If you have been struggling with living intentionally and managing these areas well, I would encourage you to consider that it is time to look for a new approach to accomplishing the goals and priorities that God has placed on your heart. Are you ready to be intentional, and follow through on your goals and priorities by taking little steps that develop habits, that help you to live life with more purpose and more meaning? If so, this course is for you! It is designed to walk you step-by-step through the process of establishing daily habits that will help you begin to live intentionally. Your Prayer Life–you can’t succeed in any of the other areas without the power of prayer! The approach is slow and steady, with small baby steps that will help you intentionally develop habits to manage your life well. Whether you are totally overwhelmed and struggling, or just needing a little bit of encouragement to focus more on being intentional in these key areas, you will find help and encouragement here to take steps that will change your life, and get you back on track. Those who register will also be invited to join a private Facebook group where I will be available to answer your questions, and encourage you as you go through the course. My hope is that we will encourage each other to keep on, and realize that we CAN live in victory, as we work on being intentional. When you register, you will get an introductory welcome email, and then access information will be sent right before the course begins. Since our relationship with God (our heart), is the foundation for everything else we will work on in the course, that is where we will start. I have found that when my heart is right with God, I will then have the wisdom and strength to work on taking care of myself physically, which enables me to have a greater ability to care for my home and family. After the section on our heart and relationship with God, a new module will be available every 21 days, allowing you to slowly establish important habits for living intentionally in each area. Since there are six modules, the course will take about four and a half months to work through. Once you register you will have life-time access. Any updates made to the course will be available to you. And if you need or want to take even longer to go through it, you can do that with no pressure or feeling that you are falling behind. 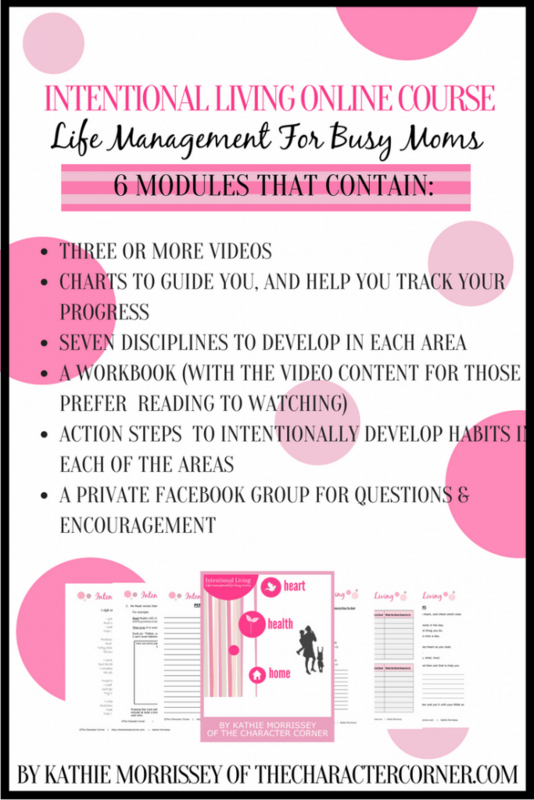 I have purposefully tried to make this as EASY as possible for you, because no one needs to be more overwhelmed! The workbooks include charts, as well as ACTION steps to help you begin to form the habits we are focusing on. Choices and suggestions will be given, to allow for whatever season of life you may be in. You can choose action steps that are less time consuming if you need to, or if you feel able to, you can choose steps that will involve a little bit more. My goal is to make this do-able, practical, and helpful in making you be successful in managing your life for the glory of God! 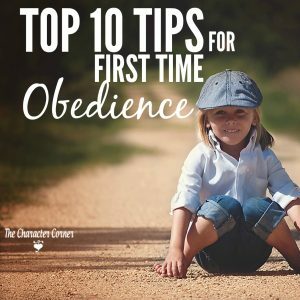 I have put a lot of prayer into creating steps that will not only help you to begin to live more intentionally, but to also develop habits that will cause you to CONTINUE to be intentional in pursuing your Godly priorities. If you’re tired of struggling to manage your life well, and are ready to live more intentionally and finish strong, I invite you to join me for this course! So if you are serious about making some intentional changes in your life, don’t wait to register! Now is your chance to move from overwhelmed and stressed, to intentionally living out the God given priorities God has given you, and living a more peaceful life. When you purchase the course you will have life time membership to all the videos, and included workbooks and charts. Because the six modules are spaced out every 21 days to give you time to develop habits in each area, it will take about four and a half months to work though it. You can take longer if you wish, or you can go back and do the course again as needed or desired. Don’t put it off — take the first step to purposeful living today. Sign up now and get started! If you have questions about the course, refer to the Q & A page. I just completed Kathie’s Intentional Living course. I was hesitant to try it because I wasn’t sure we could invest the cost and time. I am so grateful I went for it! It far surpassed my expectations. The advice is practical, encouraging and godly. Kathie provides individual coaching and prayer with regular, personal emails. It is honestly life-changing. It was a commitment (of course) and some hard work. However, the benefit to myself, my marriage and my children has far surpassed any sacrifice. This was an answered prayer for my family. I just wanted to say thank you for doing this course! You have really given me the encouragement to keep it up!! I know God has been moving in my life and everything kind of came together at once for me. I’ve been dealing with some health issues, and I’ve been consistently praying about my weight and movement, which I never did before. It’s made a tremendous impact on my reasons for losing weight and taking care of my body!! I’m down 15lbs since we started, and I’m exercising most days of the week. Thank you so much for this course! It is certainly blessing! I am drawing closer to the Lord as I am seeking Him daily. I appreciate your challenges and encouragement. I look forward to hearing from you through email daily. I am praying that the Lord speaks to me in ways I have never heard before. This course is truly a Godsend. I’ve been ignoring things and in a constant state of depression for far too long. I finally cried out to God and begged for help. I finally admitted I couldn’t do it without Him. And you came along. His timing is always perfect. So I’m trudging along, little steps, small victories! Thank you so much for all the time and effort you put into this. You’re helping so many ladies get it together. Praising God for bringing you into my path. Looking forward to this new module on health. I just wanted to let you know what an answer to prayer you have been through the intentional living study! You truly are a Titus 2 example and wanted to let you know how much I appreciate your heart to serve & impact the families of our day, through your ministry! Among many gems gleaned from this course, my favorite is the thought of “greeting God, FIRST thing in the morning! The home module has helped me as and I now put things away before going to bed to make for a cleaner looking house even if I haven’t mastered deep cleaning! Thinking & planning for the next day has helped me, even if only a few small tasks are accomplished! I feel like there’s a sense of order and peace to our days. The important things are done first, so if it all falls apart later, we’re still ok! Still on track reading my Bible daily thanks to the encouragement in the course! I loved the emphasis about the importance of focusing on our relationships in our home. I’ve had the biggest impact from Module 2, taking care of myself after 5 years of no check ups! My favorite part of the course continues to be Module 1! Waking up and having time with the Lord first thing, which continues to be a work in progress for me especially when life gets complicated. The Lord has really surprised me with this course. I thought I would be taking lots of baby steps but He has given me the grace to manage my home and life really well. And it’s quite a relief!